Particulate respirator effectively filters oil and non-oil based particulates. Carbon-layered filter reduces organic-vapor bleed-through. Cool Flow™ Exhalation Valve helps minimize heat and humidity buildup. Lightweight construction. Respirator Type: Half-Face Mask; Rating: N95; Valved: Yes; Size: One Size Fits All. 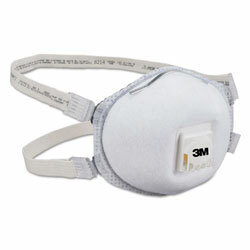 Disposable Respirators and Face Masks from 3M! 2 In Stock today.